Spring is a perfect time to celebrate the beauty of God’s Creation all around us. And, of course, Easter is the culmination of all that is renewed each year as we celebrate the Resurrection of our Lord. If you’re looking for some great ways to teach your kids and celebrate this joyous season, we’ve got some perfect activities the whole family can enjoy! Although our society likes to secularize Christian holidays like Easter – putting the emphasis on the Easter Bunny instead of Jesus – we must teach our children the true meaning of this special day. Talk to your child in the weeks leading up to Easter Sunday about the sacrifice that Jesus was preparing to make because he loved us so much. Have the kids give up something really special to them for a day or two, or the whole season of Lent if they are older, explaining that Jesus gave all He had to care for others. Younger children can begin to learn about the empty tomb and that Jesus had completed his work on Earth and had to go continue His work in Heaven. Help them to make a garden tomb out of a shoe box or clay with a large “stone” to cover the entrance. Little ones can draw a picture of Jesus and put Him in the tomb. Before they wake on Easter morning, take the picture out of the tomb, allowing the kids to “roll away the stone” in the morning to see that the tomb is empty! Older children can learn about the Crucifixion and the symbols of our faith this time of year – three crosses, symbols like the lamb representing Christ’s sacrifice, and Easter colors like white for purity and purple for royalty. They can make any number of crafts using these symbols – crosses made from popsicle sticks, lambs made of cotton balls, and “stained glass” pictures using waxed paper and tissue paper to hang on the window. Show them that just like the light shines through their picture, Jesus is the Light of the World that shines in our lives. Of course, reading passages from the Bible is important, but often hard for young children to understand due to their complexity and length. There are many great books for kids of all ages telling the Easter story, including storybooks from the Beginner’s Bible series like The First Easter and Jesus Saves The World. 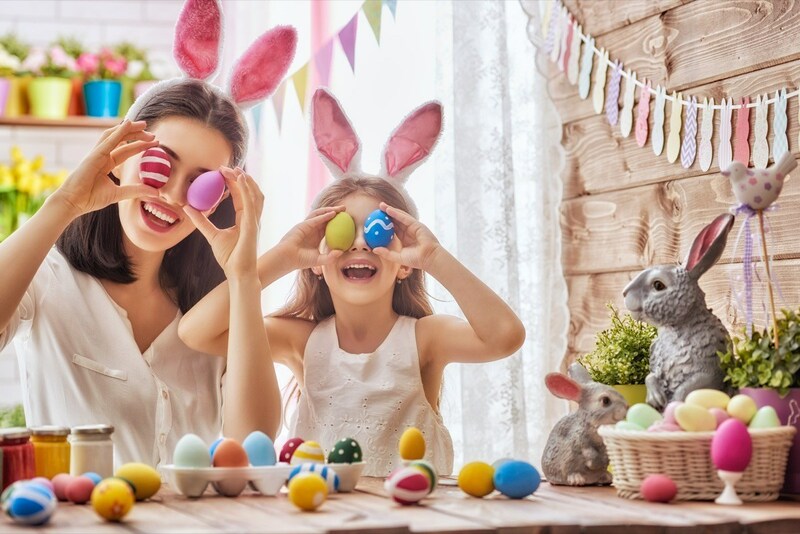 As children understand the real reason for Easter, there are also plenty of fun activities to do as a family to get ready for that Bunny! One great tradition is to have your child make their Easter basket out of the shoebox that their new pair of Easter shoes comes in! They can decorate it with construction paper and stickers or even make it a spring character like a rabbit. Add wiggly eyes, glue on a cotton ball tail and a pair of tall bunny ears, and fill it with Easter grass. This is a unique Easter basket, and they will look forward to making a new one each year. And there’s no limit to the fun ways your family can dye Easter eggs together. The little ones can use a white crayon to draw a picture before dipping the egg in the dye – the crayon will resist the dye and their picture will appear like magic. Fill a Ziploc bag with rice and place a freshly-dyed egg in the bag before it dries. Let the kids shake the bag and watch the pattern appear as the rice absorbs some of the moisture. Make crazy characters out of the eggs by gluing on small wiggly eyes and construction paper noses, ears, and mouths – or use feathers, glitter paper, sequins, or anything they can think of to make a silly design on their eggs. You can even give out prizes for the “most imaginative,” “silliest,” or “cutest” egg creature. Make your egg hunt a scavenger hunt by creating clues around the house or yard in order to find all the eggs. This can also be done to find their Easter basket on Easter Sunday. Or how about a nighttime Easter egg hunt? This is a really exciting way for the smallest kids to find their eggs. Place a small battery-operated tea light inside each of the plastic eggs you plan to hide. When the sun goes down, the eggs will give off a colorful glow! Many traditional foods are associated with Easter, and there are plenty of treats the kids can help create. Try “bunny tail” cupcakes by frosting them with white icing, sprinkling with coconut, and adding a marshmallow tail. Use jelly beans as a fun way to teach basic math skills by having the kids count, color sort, or make patterns with them. They can even be used to decorate another batch of cupcakes, this time with green-tinted coconut sprinkled on top under the jelly beans – instant edible Easter basket! Another great spring cake idea that is fun for the kids is to bake a white or yellow cake. When it’s still warm, let the little ones poke holes through the top of the cake with the handle of a wooden spoon. Mom or dad can boil one cup of water and add a box of flavored gelatin until dissolved. Pour over the cake (and into the holes) and top with whipped cream once cooled. This makes a very pretty – and tasty – design inside the cake. Or let the kids help make traditional hot-cross buns for breakfast. They will love mixing and kneading the dough, watching it rise, and forming them into rolls. Celebrate this spring holiday by letting the kids pick out several types of fresh vegetables with you at the grocery store or farmer’s market and then make a colorful springtime veggie plate. Some, like cucumbers, can be cut into shapes like miniature flowers with a mini cookie cutter. Don’t forget to leave a plate of fresh carrot sticks or some other veggies out for the Easter Bunny the night before the big day! Use your imagination with those spring themed cookie cutters! They can be used for cheese slices, sandwiches, or pancakes to make a festive meal to celebrate Easter. When it’s time for Easter brunch or dinner, have the kids make place cards, napkin rings out of sections of a paper towel tubes they decorate, or a spring centerpiece. A centerpiece idea that mom and dad will cherish is to make “Easter lilies” out of white paper. Trace the kids’ handprints, cut them out, and fold down the fingers to look like petals. Wrap the bottom with a green chenille stem and fill a vase with these beautiful flowers. One of our favorite Easter traditions is a family reading of a decades-old book, The Country Bunny and the Little Gold Shoes by DuBose Heyward. This book uses wonderful illustrations to tell the story of a mother bunny with lots of little bunnies to raise. They all do chores to help make the household run smoothly and rely on each other when Mother Bunny takes on a very important job. She also makes a great sacrifice to bring joy to someone when they need it most – a lovely story and a perfect combination of traditional symbols of spring and faith. Easter is a wonderful way to create family traditions, made even more special by the Holy significance of the day itself. Teach the kids about the symbols of renewal in your Easter celebration and how they relate to the sacrifice – and greatest gift – that Jesus gave to us so long ago. We wish you a blessed Easter filled with family, friends, and lots of fun activities that become permanent traditions. What are some of your family’s favorite Easter traditions? Leave us your comments.